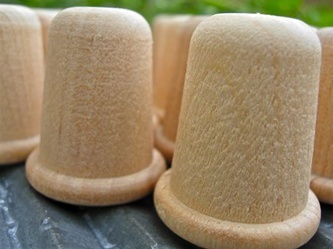 Examine our growing collection of Wood thimbles that deliver the tone you need to make your washboard stand up and take notice. How Many Thimbles do you Need? The number of thimbles you need for each hand is a personal preference. Most players use 3 thimbles (index, middle and ring fingers). Others add a 4th thimble to their pinky. Many prefer just 2 thimbles (index and middle fingers). Some players use just one thimble (typically index or middle finger). However, many players use 4 thimbles on their fingers, plus a large 5th thimble (typically 18 mm to 20 mm) on their thumb for a "full-house" of 5 thimbles. You can achieve greater musical color with more thimbles than less. But the optimum number of thimbles depends on the musical genre, type of thimble (wood, plastic, metal, horn), your personal playing style, and ultimately—what works best for you. What is Your Thimble Size? In a Rush? Find Thimble Size Instantly. If your finger measures 50 mm, then thimble size is 16 mm (50/16). Great for all rubbing surfaces.